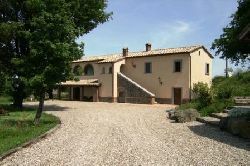 VILLAS AND APARTMENTS TO RENT IN UMBRIA, ITALY. 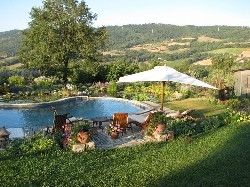 Welcome to our selection of holiday homes to rent in Umbria, Italy. The central Italian region of Umbria may be one of the few southern areas with no coastline, but there are still plenty of attractions in its two provinces to draw tourists away from the Mediterranean and the Adriatic Seas. Home to one of Italy's largest lakes, stunning rivers and waterfalls along with more unusual natural environments, Umbria's historic cities boast a fine collection of medieval buildings, impressive churches and art galleries. Whether you have travelled to Italy to enjoy the climate or the culture, you will find what you are looking for in Umbria. Although there are no traditional beaches in Umbria, the shores of Lake Trasimeno, central Italy�s largest lake, are home to several beaches where you can enjoy a swim surrounded by the region's outstanding natural beauty. A variety of water sports are available on the lake, as well as kayaking on many of the region's rivers. One of the highlights of the Umbria region are the waterfalls of Marmore, a man-made feature created in Roman times when irrigation channels were dug to provide local farmers with water. The waterfalls are an impressive 165 metres high and you can access this remote spot via one of the many walking or cycling trails in this area, which is known as the Nera River Park. Umbria, like many parts of Italy, produces its own wines, and visitors can follow a wine trail through the region, taking in visits to many of the most famous vineyards. The capital of Umbria, Perugia, is a pleasant and picturesque historic town, home to the Palazzo dei Priori - an impressive 12th century structure which now houses an art gallery. Other well-known Umbrian towns include Assisi, Orvieto and Gubbio, on of the oldest settlements in the region. As well as its historic buildings, such as the Ducal Palace and the Consul's Palace, Gubbio still holds many traditional festivals throughout the year, including the Corsa dei Ceri or Candle Race and the Palio Balestra, a medieval crossbow contest on horseback through the main square. Orvieto enjoys one of the most dramatic settings of any city in Italy and is home to a stunning 13th century cathedral, the now famous underground city, with its network of tunnels and caves, and the feat of engineering that is St Patrick's well, a 53-metre structure built in the 16th century in case of a siege. Assisi is, of course, known as the home of St Francis, and visitors can still see the hermitage outside the city walls where he is supposed to have prayed. Looking for self catering holiday accommodation in Umbria? Then below is a selection of Apartments in Umbria and villas in Umbria that can be rented direct from their owners. You can either click on each listing for further details or you can use our search engine on the left if you are looking for something in particular.